LED module 2835 1LED, 0.6vt Premium class of 5 years guarantee! 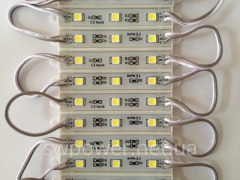 LED module 2835 1LED, 0.6vt premium class, 5 years guarantee!!! At production of this module high-quality materials are used, in the basis the aluminum plate which gives the faultless heat sink and long service life of the diode lies. The diode is covered with a polycarbonate lens with the angle of dispersion of 165 degrees. The module has the compact sizes and high brightness, can be used in signs with depth from 80 mm. You can learn wholesale prices having dialed one of above the listed numbers! Unbelievable price on LED module 2835 1LED, 0.6vt Premium class of 5 years guarantee! in Kharkov (Ukraine) company Solar Vind Pover, OOO. LED module 2835 4LED, 2,44vt Premium class of 5 years guarantee! LED module 5730 2LED, 0.96vt Premium class of 5 years guarantee! Светодиодный модуль 2835 1LED, 0.6Вт Премиум класс 5 лет гарантия!LED module 2835 1LED, 0.6vt Premium class of 5 years guarantee!¡El módulo svetodiodnyy 2835 1LED, 0.¡6éÔ Premium la clase de 5 años la garantía!